Translator’s Note: Jean-Yves Le Gallou was a member of Alain de Benoist’s GRECE in the 1970s and is a former Front National (FN) politician, as well as co-founder of Iliade , a leading identitarian think-tank inspired by the work of Dominique Venner. This article discusses the recent departure of the civic nationalist Florian Philippot from the FN, whose anti-EU and anti-euro line, to the detriment of identitarian and immigration issues, has been blamed for Marine Le Pen’s mediocre performance in the last presidential elections. The title is editorial. 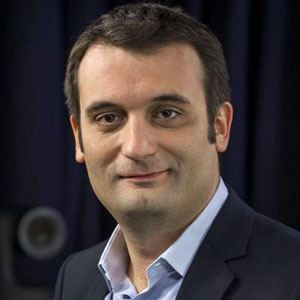 Eighteen years after the expulsion of Bruno Mégret’s followers  from the FN, Florian Philippot has walked out the door. It is tempting to compare the two events. A Le Pen is kicking out a media-savvy personality. After the polytechnician coming from the Rally for the Republic  in the 1980s, it’s the turn of the énarque  coming from Chevènement’s  ranks to sit in the dock. But the parallel stops there, given that there are so many differences! Bruno Mégret was in the FN for fourteen years. He contributed greatly to shaping its organization. He trained its cadres and activists. He was appreciated by them, which allowed him and his friends to win the internal elections in the congress of Strasbourg in 1997. He developed an intellectual current with the magazine Identité, which was the template for the identitarian tendency which is so important today. Bruno Mégret also managed stunning electoral campaigns, delivering results everywhere. In Vitrolles  he even received, along with his wife Catherine, over fifty percent of the vote, with a voter turnout of ninety percent: a record which has yet to be beaten within the FN! Mégret also enjoyed a positive image in the media which was fairly quickly exploited to undermine Jean-Marie Le Pen. Magazine covers on the theme of “Mégret is more dangerous than Le Pen” contributed to the mutual mistrust between the two men. During the split, over half of the elected officials and officers joined Mégret, taking with them their party activists. But once he was removed from the FN, Mégret was pressured by the System to renounce the rough edges of his [anti-]immigration program, which he refused to do. After that, the media spotlights went out. And with the Internet still in its infancy and social media non-existent, this lack of media visibility led Mégret to defeat in the 1999 European elections (3.5 percent for the National Republican Movement, 5.5 percent  for the FN). This boy has evidently forgotten that in politics, one must not only be feared, but also loved. Philippot departs with many handicaps: besides his (very) restricted inner circle, few people will follow him. His sovereigno-monetarist themes are not the stuff of dreams, and he has the charisma of an oyster. Finally, he will have a hard time finding his niche between Mélenchon,  who has a real position; Asselineau,  who has a real network [of supporters]; and Dupont-Aignan,  who, for his part, was able to take an identitarian turn. Philippot has one last asset which Mégret did not have after the split of 1999: the media. He will be systematically invited by the media – at least in the beginning – if only to contribute to re-demonizing the FN and knocking out Marine Le Pen, who is already in a fairly difficult position. It is uncertain, however, whether the media’s putting him on artificial respiration will save him in the long run. The moment will come when he will be unplugged. Sic transit gloria mundi! I will let the two protagonists conclude regarding their fundamental differences. For Florian Philippot: “Bruno Mégret left for a more radical political offer.” For Bruno Mégret: “Florian Philoppot is promoting a nostalgic sovereignism and a backward-looking social policy worthy of the 1960s.” One thinks that the 2010s are the 1990s, while the other dreams of the 1960s at the beginning of the twenty-first century. The original French version of this article was published on the Boulevard Voltaire Website . Bruno Mégret (b. 1949), a graduate of the École Polytechnique and a trained civil servant, was also a founding member of the anti-egalitarian organization which had ties to Alain de Benoist’s GRECE, the Club de l’Horloge, in the 1970s. He eventually left it and, after working with the Rally for the Republic party for a few years, joined the FN in 1985. He quickly rose to prominence in the Party and was very popular. In the 1990s, he began criticizing what they called Jean-Marie Le Pen’s “extremist” positions for holding back the Party, and called for the organization of labor unions affiliated with the FN, which went against the Party’s anti-union stance. He left the Party in 1998 and founded the National Republican Movement, a nationalist party, which he led until he retired from politics in 2008. Rally for the Republic was a mainstream Gaullist conservative party founded by Jacques Chirac from 1976 until it was merged into the Union for a Popular Movement, the party of Nicolas Sarkozy, in 2002. A graduate of the École nationale d’administration, a school for civil servants. Jean-Pierre Chevènement (b. 1939) is a Left-wing sovereignist, and was one of the founders of France’s Socialist Party. A suburb of Aix-en-Provence with 36,000 citizens. The minimum threshold for a party to enter the French parliament is five percent. An industrial city in Lorraine of 22,000 citizens. In 2012, Philippot was defeated in the runoff of the parliamentary election in Forbach. Jean-Luc Mélenchon (b. 1951) is a politician from the Left Party. François Asselineau (b. 1957) is the President of the anti-EU Popular Republican Union. Nicolas Dupont-Aignan (b. 1961) was the founder of Arise France, a Right-wing party. He supported the Front National in the second round of the May 2017 elections, setting an important precedent.